There have been a number of pop culture items to bear the title of “Love Bites” - among them a 2011 NBC series, a 1993 film starring Adam Ant, and songs by Def Leppard, Grace Jones, and Judas Priest - but to our knowledge, only one of them came out 37 years ago today, and that's the album by one of Bolton, England's finest musical exports: the Buzzcocks. 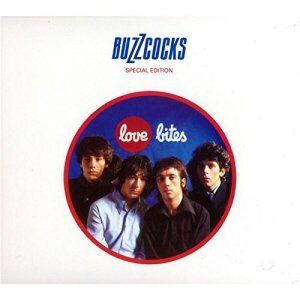 Love Bites was the Buzzcocks' sophomore album, and it very much found the band avoiding any sort of slump, something which was undeniably confirmed with its second song, “Even Fallen In Love (With Someone You Shouldn't've),” a track long considered by just about everyone to be one of the greatest punk-pop singles of all time. The whole album is strong, though, with Martin Rushent's production serving Pete Shelley's compositions well…oh, and Steve Diggle's compositions, too, lest we neglect mentioning that this was the first album where he began to stand on his own somewhat as a songwriter. If you're a Buzzcocks fan and you don't already own a copy of Love Bites, we'd recommend that you go the digital route and pick up the special edition version that emerged a few years ago. The original album may have only had 11 tracks, but the special edition ups it to a grand total of 45 tracks, and if that sounds like Buzzcocks overkill, it really isn't: it's merely a fuller picture of where the band was during that particular era of their career, including additional post-album singles, live tracks, radio performances, and B-sides.